Click the New button on the Keynote toolbar. Choose New Slide from the Slide menu. Right-click (or Control-click) in the Slides list and choose New Slide from the menu. Add new slides or move them around from the Slides list. 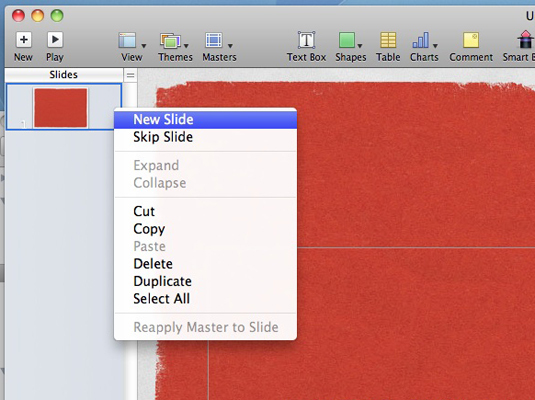 Keynote adds the new slide to your Slides list and automatically switches to the new slide in the Layout pane. To move slides to different positions in the Slides list (and therefore a different order in your Keynote slideshow), drag each slide thumbnail to the desired spot in the list.